A pie chart is a visual representation of data and is used to display the amounts of several categories relative to the total value of all categories. Pie charts are used, for example, to show the production of one factory in relation to the output of the company or to show the revenue generated by one product relative to the sales of the entire product line. Before you create a pie chart, enter the chart data. Then, highlight the data you want to use in the pie chart. To follow along with this tutorial, enter the data shown in the image above into a blank worksheet. The basic pie chart is a plain, unformatted chart that displays the categories of data, a legend, and a default chart title. On the ribbon, go to the Insert tab. Select Insert Pie Chart to display the available pie chart types. Hover over a chart type to read a description of the chart and to preview the pie chart. Choose a chart type. For example, choose 3-D Pie to add a three-dimensional pie chart to the worksheet. Edit the default chart title to add a more suitable one. Select the default chart title. A box appears around the title. Click on the text to put Excel in edit mode and place the cursor inside the title box. Press Delete or Backspace to delete the existing text. Type a chart title. For example, type The Cookie Shop 2018 Revenue from Sales. To separate the title into two lines, place the cursor between two words and press Enter. 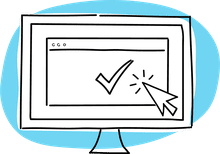 For example, place the cursor between 2018 and Revenue. There are many different parts to a chart in Excel, such as the plot area that contains the pie chart representing the selected data series, the legend, and the chart title and labels. All these parts are separate objects, and each can be formatted separately. To tell Excel which part of the chart you want to format, select it. If you don't get the desired results, the right part of the chart was not selected. A common mistake is selecting the plot area in the center of the chart when the intention is to select the entire chart. The easiest way to select the entire chart is to select a corner of the chart. If you make a mistake, use the Excel undo feature to remove the mistake. Then, select the right part of the chart and try again. Select the plot area of the pie chart. Select Add Data Labels. 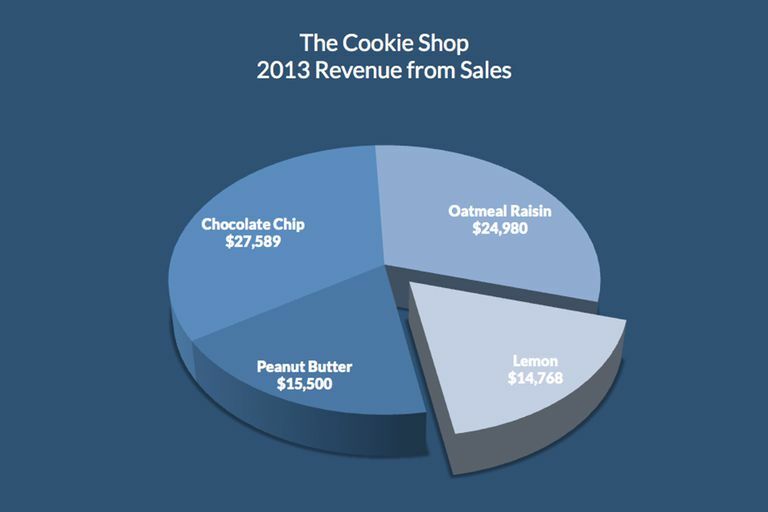 In this example, the sales for each cookie is added to the slices of the pie chart. When a chart is created in Excel, or whenever an existing chart is selected, two additional tabs are added to the ribbon. These Chart Tools tabs, Design and Format, contain formatting and layout options specifically for charts. Select an area on the chart background to select the entire pie chart. To change the color of the pie chart slices, go to Chart Tools Design and select Change Colors. Hover over a row of colors to preview the color in the pie chart. Choose a color. The pie slices change to varying shades of the selected color. To change the background color of the pie chart, go to the Chart Tools Format tab. To add a gradient to the background color, select Shape Fill. To change the color of the text in the title and data labels, select the Text Fill dropdown arrow. When you want to add emphasis to a slice of the pie, drag or explode the slice from the rest of the pie. After a slide is exploded, the rest of the pie chart shrinks so that the chart area stays the same size. Resizing a chart may move the data labels outside the pie slices. Drag a data label to reposition it inside a slice. Select a slice of the pie chart to surround the slice with small blue highlight dots. Drag the slice away from the pie chart to explode it. To reposition a data label, select the data label to select all data labels. Select the data label you want to move and drag it to the desired location.